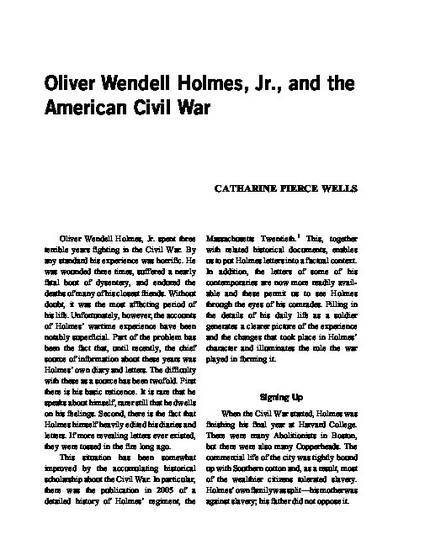 Oliver Wendell Holmes, Jr. spent three terrible years fighting in the Civil War. By any standard his experience was horrific. He was wounded three times, suffered a nearly fatal bout of dysentery, and endured the deaths of many of his closest friends. Without doubt, it was the most affecting period of his life. Unfortunately, however, the accounts of Holmes’ wartime experience have been notably superficial. Part of the problem has been the fact that, until recently, the chief source of information about these years was Holmes’ own diary and letters. The difficulty with these as a source has been twofold. First there is his basic reticence. It is rare that he speaks about himself, rarer still that he dwells on his feelings. Second, there is the fact that Holmes himself heavily edited his diaries and letters. If more revealing letters ever existed, they were tossed in the fire long ago. This situation has been somewhat improved by the accumulating historical scholarship about the Civil War. In particular, there was the publication in 2005 of a detailed history of Holmes’ regiment, the Massachusetts Twentieth. This, together with related historical documents, enables us to put Holmes letters into a factual context. In addition, the letters of some of his contemporaries are now more readily available and these permit us to see Holmes through the eyes of his comrades. Filling in the details of his daily life as a soldier generates a clearer picture of the experience and the changes that took place in Holmes’ character and illuminates the role the war played in forming it.